Today I’d be talking about different types of tools you can use to apply your foundation. This post is the continuation of basic foundation series which I’ve talked about earlier Here and Here. Flat Foundation Brush: The oldest and most commonly used foundation tool is the flat foundation brush. A flat foundation brush is flat and usually pointed in shape reaching out to the corner and small areas of face like around the nose and inner corner of eyes. A flat foundation brush is great for applying liquid foundation, the best way to use it is in downward strokes to help settle facial hair and for getting a good coverage. You can always go on building the foundation with second application with a flat foundation brush but the only downside with this brush is that it can leave patchy marks on skin. This brush is good for dry, flaky skin. Tip: Damp the brush with a facial mist or rose water to get a good application and finish. Stippling Brush: Stippling brush is a dense foundation brush with two toned bristles, white at the top and black on the bottom part of bristles. It’s also known as a duo fiber brush as it is made with two types of fiber. You have to use it in light circular motions by lightly buffing the foundation in your skin. A stippling brush is great if you have got acne marks and visible pores, it just fills in the pores when you use it in buffing motion and gives a perfect airbrushed skin but don’t use it if you’ve got dry skin since it can aggravate the dry areas of skin as it is used in a buffing motion. Flat-topped Kabuki Brush: A flat top kabuki brush is a large-sized brush with densely packed flat bristles. It has to be used in circular motions by pushing it into the skin. A flat top kabuki brush gives really good coverage somewhat medium to full (also depends on your foundation) without the bristles leaving any streaks or lines. And if you want a sheer coverage, you can just swirl the kabuki brush in circular motion and get a light coverage. Again, flat top kabuki brush is not a good option for dry skin. A flat top kabuki brush is also known as the buffing brush. 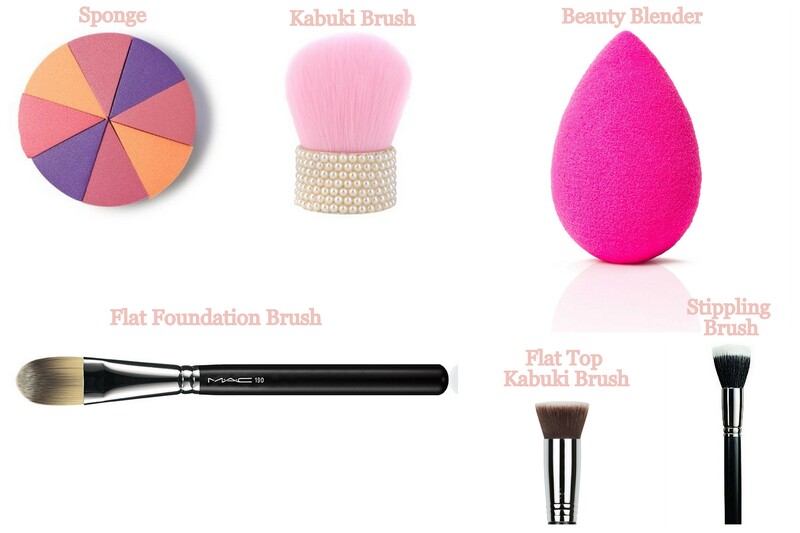 Kabuki Brush: A kabuki brush is a round dome-shaped brush with dense bristles. Kabuki brush is used for application of mineral foundation or powder foundation. In fact, most mineral foundation comes with an in built kabuki brush for seamless application. A kabuki brush is made of synthetic or real fibers. It’s best if you could get a real fiber kabuki brush. Beauty Blender: The newest development in the beauty industry! Well, not exactly newest but the latest and most famous development I should say to be precise! A beauty blender is an egg-shaped sponge which is used for application of liquid, cream and powder products making it a multi-purpose beauty product. To get the best results from your beauty blender, use it damp (dip it into a bowl of water or run it under a tap until it’s all wet then squeeze out the excess water by wrapping it inside a towel or a cloth but don’t dry it fully, let it remain a lil damp). Doing this doubles up the sponge size which as a result soaks up less foundation (liquid), and gives flawless coverage. Now how to use it to get the best coverage, dunk the bottom end of the beauty blender into your foundation (by taking out the product onto the back of your hands) and then dab the blender in your foundation or just simply dot the foundation all over your face and then what you got to do is push the beauty blender into your skin like dabbing it in and out. And for the inner corner of your eyes and around the nose, use the pointed tip of the blender same way by pushing it in and out on your skin. A beauty blender gives the maximum coverage and fully airbrushed, flawless finish. You can also use it to apply concealer with the pointed tip of the beauty blender and also with powder products but do not damp it when using it to apply powder products. Sponge: A sponge comes in various shapes and size and can be used by pretty much every skin type except acne prone skin as it provides a sheer coverage and it won’t be able to hide acne or acne marks. Sponges can be used for application of liquid, cream and powder products. You can use it damp same as the beauty blender or dry! Sponges are used mostly for the application of thicker liquid foundation like mousse foundation. Sponges are quite good for foundation application but the downside is that they don’t provide heavy coverage and also soaks up a lot of foundation. What’s your favorite way of applying foundation? Great post Arzoo. I love using kabuki brushes to apply my foundation. Even my favorite method to apply foundations is using a flat kabuki brush!! I love stippling brush and flat foundation brush for smooth application of foundation! Such an informative post for the makeup beginners.